Create a content and design strategy for the sign or signs. What this means is, look at the purpose of your sign and why you are using it before choosing the best platform for you. Take into account where the sign is placed, who will see it, and what your message should say. Next, you need to develop the information, pictures, graphics, videos, and content that will be on the sign. Taking content from your existing brand is the best way to create a unified look and feel. Determine whether your sign is going to be played on a feed, streamed, or played on a media player. This can help you determine the estimated maintenance costs; some signs can be updated remotely while others need to be physically updated on-site. For example, if the digital sign connects to a media player, then it can be used whether or not there is an Internet signal present in the building, but you will need to physically update that media player. On the other hand, if a sign is streaming content, then it needs a stable internet connection to pull content but can be updated remotely. Before getting any signage, you should ask yourself: Where is the sign going to have the greatest impact and ROI? Will visitors and guests interact with it? Will it pull in walk-in traffic? Or is it intended as a Point-of-Sale sign to upsell other products? A sign at the front of the store or building may catch your audience’s eye and pull them into your business while billboards or shopping center signs have a larger pull and can attract freeway traffic and other motorists to your location. A digital sign next to the cashier or point-of-sale area can have notifications for current specials or related products. Digital signs can also serve as an interactive directory and pricing guide throughout the store. Each location has a specific purpose and use that affects the way your digital sign engages your clients. A very important question to ask is, how will this sign engage my customer? How will they interact with it? Digital signs are more interactive than print signs and are often used to assist customers in their journey through your store, similar to an employee. For example, a digital sign can have a touch screen, which allows customers to search the store’s inventory or products, find a product in a specific part of the store, or help answer general customer service questions. One huge benefit to a digital sign is that it is easier to change the content more frequently. If you don’t intend on changing the sign regularly, then it may be more cost effective to purchase a printed sign. Do you have daily, weekly or monthly specials? This may be a great way to promote them. 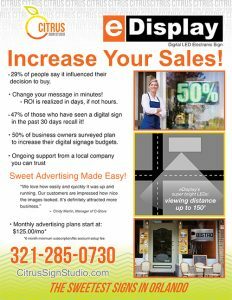 Imagine if you had large signs through your store and could promote quick flash sales. What type of crowds and excitement would that draw?! Come see us if you are looking for fun, creative and effective ways to grow your business! Have more questions about digital signs and how they could suit your business needs? Talk to us today. Citrus Sign Studio has the knowledge and resources to provide the best custom digital & LED sign to suit your needs. Looking to add some printed signs for your business? Or are you feeling like your business can use a digital sign upgrade? Citrus Sign Studio has you covered, contact your favorite Orlando sign company for a free quote and to learn more about digital signage.